For the 1990s-2000s Ford design theme, see New Edge. The first generation Edge is based on the Ford CD3 platform shared with the first generation Ford Fusion, Mazda CX-9, first and second generation Mazda 6 and Lincoln MKX. Ford also markets the second-generation Edge in European markets. The Edge uses Ford's CD4 platform. The vehicle is assembled at Ford's Oakville Assembly, Ontario, Canada assembly plant. The first generation Edge had debuted at the 2006 Detroit Auto Show with production starting in January 2006 as a 2007 model year. The SE includes cloth seats, single-zone manual air-conditioning, AM/FM stereo with single-disc CD/MP3 player, and 17-inch painted aluminum wheels. The SEL includes unique cloth seats, 6-way power driver's seat, premium AM/FM stereo with 6-disc in-dash CD/MP3 player, leather-wrapped steering wheel with secondary audio controls, and 18-inch painted aluminum wheels. The Limited includes leather-trimmed seats, and optionally, 6-way power front passenger fold-flat seat, EasyFold second-row seat back release, dual-zone electronic automatic temperature control, SYNC in-car connectivity system, and 18-inch premium chrome-clad aluminum wheels. The Limited trim level replaced the SEL Plus in 2008. The Sport trim level debuted at the 2008 Chicago Auto Show, with sales beginning as a 2009 model. The trim level includes leather-trimmed with grey faux suede inserts, reclining 60/40 fold-flat seats with center fold-down armrest, second-row seat back release (marketed as EasyFold), premium AM/FM stereo with 6-disc in-dash CD/MP3 player, SYNC in-car connectivity system, larger diameter chrome exhaust tips, 20-inch premium chrome-clad aluminum wheels, all body-colored trim and optional 22-inch wheels. Standard transmission is a 6F50 6-speed automatic transmission. Safety equipment includes standard dual front airbags, front side-impact airbags, side curtain airbags, anti-lock brakes, traction control, electronic stability control, and a tire-pressure monitoring system. Ford Edge recognized as one of "Best Cars for Families" in 2007 by AAA and Parents Magazine. 3.5 L Duratec 35 V6 named one of the world's "10 Best Engines" by Ward. Ford Edge named "2007 Urban Truck of the Year" by On Wheels, Inc. Edge wins J.D. Power and Associates' 2007 "APEAL Award"
Ford Canada announced in June 2007, that a gasoline-electric hybrid version of the Edge was to debut in the 2010 model year. The model was expected to use a new hybrid system from Ford, pairing an electric motor with a V6 engine. A concept of the Ford Edge with HySeries Drive was shown at the 2007 Washington Auto Show and the automaker claimed potential future production. This was a hybrid electric vehicle that used hydrogen fuel along with plug-in charging of its lithium-ion battery pack, for a combined range of over 320 kilometres (200 mi). The HySeries system was introduced in the Ford Airstream concept from the 2007 Detroit Auto Show. The updated Ford Edge was revealed at the 2010 Chicago Auto Show with production starting on February 12, 2010 as a 2011 model. Exterior changes include a new front fascia, wheels, and a revised bumper, while the revamped interior features upgraded materials and capacitive touch controls in place of some conventional buttons and switches, which can also be seen on the second-generation Lincoln MKX. Engines offered for the updated first generation: a 2.0 L EcoBoost I4 engine, a 3.5 L Duratec with Ti-VCT making 285 hp (213 kW) and 253 lb⋅ft (343 N⋅m) of torque, and the Sport model had the same 3.7 L Duratec engine as the 2011 Lincoln MKX with 305 hp (227 kW) and 280 lb⋅ft (380 N⋅m) of torque. The turbocharger in the new 2.0 L engine is designed for 150,000 miles or 10 years. In the American Range: The SE includes cloth-trimmed seats, single-zone manual air-conditioning, steering wheel controls, and 17-inch painted aluminum wheels. The SEL includes everything in the SE plus unique cloth-trimmed seats, 6-way power driver's seat, dual-zone electronic automatic temperature controls (DEATC), leather-wrapped steering wheel with cruise control, 5-way switch pads and secondary audio controls, 18-inch painted aluminum wheels, reverse sensing system, and supplemental parking lamps. The Limited includes everything in the SEL plus leather-trimmed seats, 10-way heated power driver's seat, Sony audio system with HD radio with 12 speakers in 10 locations, MyFord Touch with two driver-configurable 4.2-inch color LCD displays in cluster and 8-inch color LCD display in center stack, Ford Sync including media hub with 2 USB ports, SD card reader and video input jacks, 18-inch chrome-clad aluminum wheels with optional 20-inch chrome-clad aluminum wheels, rear view camera, and 6-way heated power, fold-flat front passenger seat. In Israel this trim is called SEL Plus. Limited options include HID headlamps, BLIS (Blind Spot Information System), and Adaptive Cruise Control. The Sport includes the 3.7 L Twin-independent Variable Cam Timing (Ti-VCT) V6 engine from the Mustang, 6-Speed SelectShift Automatic transmission with paddle activation, unique Charcoal Black leather-trimmed seats with Silver Smoke Metallic inserts, 22-inch polished aluminum wheel with Tuxedo Black spoke accents, body-color front and rear lower fascia, 4-inch chrome oval dual exhaust tips, and body-color side lower cladding and rocker molding. For 2015, the Ford Edge was redesigned with a new Taurus and Explorer-like grille, new headlights, LED combination taillights, increased interior room, and a rear-view camera. This generation of the Edge comes with a standard EcoBoost engine, the all-new 2.0L (only the displacement and bore-center spacing carry over), which has a new twin-scroll turbo to boost low-end torque figures. Unlike the previous 2.0L EcoBoost, the 2015 generation has a towing capacity of 3500 pounds and is available with all-wheel drive. Mid-spec engine is a 3.5L V6, with slightly reduced power output. The highest engine in the range, powering Sport models, is the new 2.7L twin-turbo EcoBoost V6. For the first time, Ford markets the Edge in European markets (as part of the company's "One Ford" strategy); it sits above the Ford Kuga. Gasoline engines are not sold in Europe; instead this market receives a pair of turbo-charged Duratorq diesel engines as used in other Ford Europe products such as the Ford Mondeo. Both engines are mated to an all-wheel drive system as standard; there is no option for two-wheel drive. The two engines are rated at 180 hp and 210 hp. Which output the customer receives is entirely dependent on the transmission choice, with a 6-speed manual as standard mated to the 180 hp unit. A 6-speed PowerShift dual-clutch transmission automatic option is available, mated to the 210 hp unit. In Australia and New Zealand, the Edge is retailed at the Ford Endura with the launch of the 2018 model, which is the successor of the Ford Territory with a retail price of $NZD73,900 with the ST-Line variant made available to New Zealand. For Australia, the Endura was made available with the Trend, ST-Line and Titanium variants with retail prices starting from $AUD4,990 to $6AUD7,990 with ORC included. Ford also announced that a new model of Edge, the ST would be offered instead of the Sport as the top trim level for the line. It will feature a 2.7 L EcoBoost twin turbocharged V6 engine producing 335 horsepower (250 kW), a modest 20 horsepower (15 kW) increase over the 2018 Sport, which used the same engine. ST styling will include as a dark-finished mesh front grille, aluminum-alloy wheels, and unique interior. The 2019 Ford Edge will be offered in nine exterior colors, some of which are new for 2019. Post-collision braking: Automatically applies brake pressure when a collision event is detected. Evasive steering assist: Assists drivers in steering around stopped or slower vehicles in order to avoid a possible collision. Adaptive cruise control with stop-and-go lane centering: Allows the vehicle to maintain a comfortable driving distance and helps reduce stress during longer drives. The 2019 Edge made its debut at the 2018 North American International Auto Show in Detroit, Michigan, and will go on sale in the spring of 2018 as an early 2019 model year vehicle. ^ "2009 Ford Edge Sport". Inside Line. Archived from the original on 2012-12-10. ^ "2012 Ford Edge | View Full Engine Specifications". Ford.com. Archived from the original on 2012-12-10. Retrieved 2012-01-06. ^ "Ford Edge Crash Test Ratings". NHTSA. Archived from the original on 2008-10-12. Retrieved 2008-08-12. ^ Lynberg, Matthew (10 June 2016). "Ratings". NHTSA. Archived from the original on 4 March 2016. Retrieved 30 April 2018. ^ Van Alphen, Tony (2007-06-22). "Ford hybrid plans unclear after 2008". The Star. Toronto. Archived from the original on 2012-10-07. Retrieved 2018-03-23. ^ "Future Vehicles Preview". Inside Line. Archived from the original on 2012-12-10. ^ "2011 Ford Edge and Edge Sport". Car and Driver. Archived from the original on 2012-12-10. Retrieved 2010-04-04. ^ "2011 Lincoln MKX and 2011 Ford Edge interiors revealed". egmCarTech. 2010-01-07. Archived from the original on 2012-12-10. Retrieved 2010-04-04. ^ Paukert, Chris (2010-02-15). "2011 Ford Edge gets three engine choices, more ambitious Sport model — Autoblog". Autoblog.com. Archived from the original on 2012-12-10. Retrieved 2010-04-04. ^ "MY2011 Ford Edge Features First North American Application of 2.0LEcoBoost, Two Ti-VCT Engines". GreenCarCongress. 2010-02-10. Archived from the original on 2012-12-10. ^ "2016 Ford Edge SUV AWD". National Highway Traffic Safety Administration. Archived from the original on 1 October 2015. Retrieved 30 September 2015. ^ "2015 Ford Edge Midsize SUV". IIHS. Archived from the original on 30 September 2015. Retrieved 30 September 2015. ^ "All-New 2019 Ford Edge SUV Coming Soon". www.ford.com. Archived from the original on 2018-01-12. ^ "Revving Up: Ford Drives New Edge ST into Showrooms, Accelerating its SUV Sales Momentum". media.ford.com (Press release). January 11, 2018. Archived from the original on January 14, 2018. Retrieved March 23, 2018. 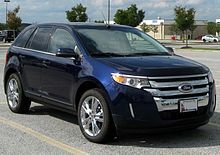 Wikimedia Commons has media related to Ford Edge. Wikimedia Commons has media related to Ford Edge Hybrid.